Biosphere is the main recording name of Geir Jenssen (born 1962), a Norwegian musician who has released a notable catalogue of ambient electronic music. 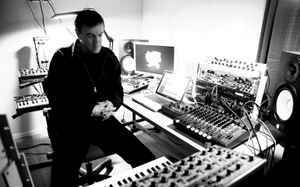 He is well known for his "ambient techno" and "arctic ambient" styles, his use of music loops, and peculiar samples from sci-fi sources. His track "Novelty Waves" was used for the 1995 campaign of Levi's. His 1997 album Substrata was voted by www.hyperreal.org as one of the all time classic ambient albums. New album coming soon : The Senja Recordings! will be released in format : 2xLP / 1xCD! Biosphere is totally unique. In a time when house music was new, this sounded from outer space. It was just that incredible. No human could make this. Absolute music pinnacle, timeless, original, unique soundscapes. This is the music that you could easily hear in a a busy/noisy urban area thanks to it's unique style and sound frequencies. sources of inspiration for people for many many years, as the songs and albums are truly unique. There's no point in listing the albums. I have to say though, Biosphere's latest twist towards the minimal and (in my opinion) over-artsy, I feel is something of a tragedy. Here's a man who can pick samples so exquisitely, and shift between rhythm and sound textures with delightful playfulness, and who can build so heavy, unique but recognizeable atmospheres. He has now put all of that aside to create this more monotone, invariable music. Maybe in an attempt to create "higher" art. This development reminds me of Autechre and Aphex Twin in that aspect. The former playfulness (which in my opinion is what truly creates art), is put aside to push the extremes in an attempt to be the new Picasso or something to that effect. Ah well. You just gotta respect these excellent musicians' choices and remember their first works, as sweet as another playful release would be.. This man, in no doubt, knows his job. Born in Norway, he represents cold nature of Northern lands within his works. His music is shivering, very deep and charming with, of course, it's own style, which Geir likes to experiment with. For example, techno-influenced beats on Microgravity and Patashnik, or literally organic waves on Shenzhou, or even minimal ambience on Autour De La Lune. Not only it is worth checking Biosphere's albums and the Higher Intelligence Agency albums, but I must add that the 2 projects released under the name "Fires Of The Ork" (collaboration with Pete Namlook from the FAX label)are ones of the most brilliant atmo-ambient and beat-orientated ambient projects from Geir Jenssen. Come On guys! wake up and run for the next project called 'Autour De La Lune' under Biosphere's name. Also Check the website for nice exclusive tracks!